The American-Arab Anti-Discrimination Committee (ADC) enthusiastically welcomes, Iman Boukadoum, to our legal team as a Senior Staff Attorney. A human rights lawyer, she has over 7 years of policy, litigation and community engagement experience, focusing on intersectional ways in which the War on Terror, War on Drugs and immigration law, harm Arabs-Americans and other marginalized communities. Prior to joining ADC, as a public interest litigator, she handled a diverse docket of asylum and immigration cases, as well as national security, family and domestic violence lawsuits. 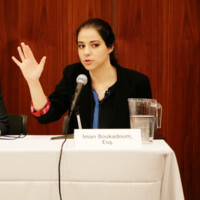 Moreover, Boukadoum has wide-ranging policy expertise from criminal justice reform, to immigration and national security investigative research and advocacy work. Additionally, her extensive grassroots engagement background, recently culminated in the creation of an 18-month Interfaith Leadership Academy that focused on civic engagement, legal literacy, and community organizing training for marginalized New York communities. As ADC’s Senior Staff Attorney, Boukadoum will handle pro bono direct services, as well as strategic, litigation cases. Second, she will engage in extensive policy civil rights advocacy on behalf of Arab-Americans and other communities. And perhaps most importantly, Boukadoum will consistently interact with grassroots community members, through town hall meetings, know-your-rights workshops and beyond. We look forward to her collaborations with partners at this critical historical juncture for American-Arab communities. Please feel free to email her at iman@adc.org.